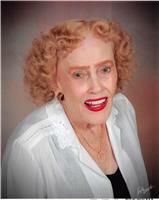 Kitty Atwell Murdock, 87, of Malone, went home to be with the Lord on Thursday, August 9, 2018. A proud resident of Malone, Florida, she was a homemaker and member of the First Baptist Church of Malone where she served in the choir, WMU, and was a Sunday school teacher for many years. She also gave many hours serving as president of the Malone JOY Club. Referred to as "Miss Kitty" by those that knew her, she was the definition of a classic southern lady. She enjoyed spending time with her family and sending cards and letters to her friends and family near and far. She was preceded in death by her parents, George Leslie & Lena Byrd Atwell; her husband of 49 years, Tyree L. Murdock and a brother, Wilber Atwell. Survivors include her daughter, Sandra Charlene Murdock and husband, Gene Smith of Ashford Alabama; one son, Rusty Murdock and wife, Mary Carol of Malone; her hearts, granddaughters, Marcy Murdock and Kyndal Murdock Schuler & husband, Clay; great grandsons, Charley Wagner, Seth Taylor and Silas Evans Schuler of Malone; step-grandchildren, Stuart Smith and wife, Isabelle, Windy Burkette and husband, Lee, Cindy Majors and husband, Ronnie, Tiffany Norris and husband, Eric, and Candy Smith, all of Alabama; a special niece, Carolyn Padgett of Wicksburg, Alabama and a host of great nieces & nephews. She is also survived by special friends, Hazel Johnson and son, Karl Cook of Tampa, Dianne Kern of Minnesota, and Opal Proctor and husband, Charles of Grangeburg, Alabama.